While nothing replaces a thorough reading of the Swap Info Guide, the swap mods would like to review a few things that both swappers and organizers may not be aware of. We encourage everyone interested in swapping and/or organizing a swap to take a look through the Swap Info Guide for all the rules of swapping on Craftster! For experienced swappers/organizers if it has been some time since you have read the Swap Info Guide, please take a look to refresh your memory. Did You Know- Feedback must be opened immediately! If you are an organizer you must open feedback for yourself (and your co-organizer if you have one) right after you post your new swap on the swap board. Once you have checked the profile of any potential swappers to make sure they are eligible, you need to open feedback for them and add them to your swapper participant list. 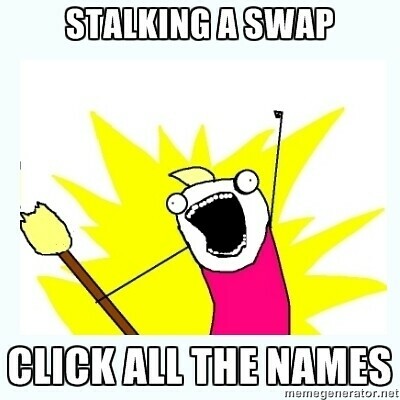 If they are on the swapper list, they should have your swap open in their profile. This is an important habit to get into as an organizer! Post your swap, open your own feedback. It is surprising how many people forget in the excitement of posting a new swap! The swap thread is the main source of updates and information for every Craftster swap and a very important Swap Rule is that everyone who has signed up for a swap must post at least once in the swap thread. Although this is a basic part of swapping, organizers should send a reminder if they notice that one of their swappers has not posted in the thread. As an organizer you can request in your sign up rules that potential swappers post in the signup thread before you open feedback for them (which is likely the easiest way to keep track) OR note beside their name on the participant list **needs to post in the thread. As a swapper it is good practice to get into the habit of posting in the swap thread before you send in your signup, which makes it much easier not to forget! Please be aware that a swapper may be dropped from a swap if they do not post in the thread before the close of the swap and partner matchup. Organizers should open a Help Desk ticket in this instance. I like this rule! It feels a bit safer to swap when your partner engages in the thread...part of the fun is to get to know people a bit and to give compliments and support to your fellow swappers...thanks for the reminder! I am new here and really want to swap Smashing/ Junking/ Paper items with others. Do a lot of these occur and are most swaps "themed"? Thank you for your time. I make sure to post in the swap thread before I send my swap sign-up in. I'm lazier than you guys, when I organize, I just require people to post before I approve and add them to the thread lol! I know I get a bit nervous when my partner hasn't posted yet, I agree with alwaysinmyroom that part of the fun of swapping is the encouraging words, compliments, getting to know your fellow swappers a bit better. BTW I like to give compliments when ever I get the change! @ doulakk: check out the organized swap board and find out! And you could always ask people if they are interested in such a swap by asking that in (on/at, I don't know) the idea-board. Re: Did you know-FEEDBACK must be opened immediately! Great reminder! I try not to start a swap unless I know I'll also have time to open my own feedback at the same time. I don't want to get in trouble with the swap mods! Did You Know- you can make member names clickable on your swap list! This is a handy tip for swap organizers which is easy to do. When adding your new swappers onto your swap list (right after you have checked their profile for eligibility and opened feedback for them of course) you can make their names clickable by using the button above the smilies that has a little guy in pink on it before adding the name OR highlighting the name then clicking the Insert link to member button. Making your swappers names clickable on your swap list makes it much easier for you to access their profile to check if the swap shows up, for partners to access profiles and for swap mods to check for necessary information as well. Re: Did you know-you should use the Help Desk for feedback mistakes! - including a space or two when cutting and pasting names into the feedback form. For example in the database (bob) with a space becomes a new member (bob ) and thus the feedback will not show in the profile of the member (bob) that you are attempting to enter. Pretty self explanatory...we appreciate it when you let us know any feedback mistakes via Help Desk ticket so we can fix it! Especially the extra (probably non- existant Craftsters) names that may be entered in error! Anyway, my help desk ticket was answered pretty soon and my non-existing swap was being deleted! Thanks, moderators!!! We love you!! Just so you know! And don't forget to select "swap related" when you do so! Otherwise the swap mods can't see the help ticket! I have lots of love for people who do this! SO. MUCH. LOVE. Yeah, I've organized a ton of swaps and am a mod (which means nothing as far as my brain remembering things) and I have to put in a help ticket for at least every other swap I run! Hahaha! Well that is a relief! Means my English isn't all that bad, hihihi! For now I'll keep with being a swap participant, which is so much fun!!! Thanks for sharing it all with us, mods: your experiences and "did you knows". Love to read them! Re: Did you know-swapper send/receive lists need to be updated! Did You Know - Organizer Swapper lists need to be updated right to the end of your swap! This is a requirement that is so important for swap organizers to keep up on right to the very end of your swap! As each person in your swap sends and receives the list should be updated. It should also reflect swappers who are late with communication or who are out of communication and any angels you have lined up should be recorded there as well. This updated list is a valuable source of information should the swap mods need to research particular swappers/swaps in the future so please remember to keep updating until your swap is done and you move it into the archives! Very self explanatory and a swap requirement that sometimes gets forgotten as a swap nears completion. Great tip! It's so easy to get a bit lax at the end....I'll try to keep this in mind! Re: Did you know-organizers can move their own swap threads? You can move your own swap threads! This is one of those things that can be a little hard to figure out the first time you need to do it (I spent hours looking!) but very "smack your forehead eureka" once you do Once your swap is closed to signups you will need to move it to "Active Swaps Where Sign-Up Period has Closed"; when your swap is completely finished as in everyone has sent/received and has appropriate feedback it will then need to be moved to the "Archive of Swaps that are Totally Finished" All you need to do is scroll down to the very bottom of your swap thread and click on the MOVE TOPIC button that you see on the left. A pop up menu will appear, just choose the appropriate board and click the Move Topic button. Done! You should be able to move any thread you start actually! So if you start a project or question thread in the wrong place and want to move it, this is the same process. Re: Did you know-Posting Pictures is NOT required for feedback? When a participant's package is received, as long as that package meets the swap requirements, they get Positive Feedback. The only requirements to receive Positive Feedback are that a package was sent (ideally on time) and that it meets the size/time requirements as outlined in the particular swap sign up. As a swapper please try and timely post pictures of your received package but if you are not able to it is nice let your partner know that you can't post pictures so that they can show off what they worked so hard to make you. Organizers do feel free to note that a swapper did not post pictures in the comments section if you wish. I think I read all there is to read about swapping, very thoroughly.... You didn't post anything yet that I didn't know! I am absolutely NOT saying that you are wasting your time posting this, because I like reading it. That way I know for sure I actually UNDERSTOOD it! I was wondering about this as someone who is new to Craftster. Even if someone can't post pics shouldn't they have to at least acknowledge in the swap gallery or thread that they received their package instead of just sending their partner a personal message or notifying the organizer. If they don't it almost seems like their partner flaked on them even if the organizer gives the person feedback. I look at a lot of the galleries and wonder sometimes why there were a certain amount of partners but not all of them have posted pics or comments that they received. It kind of makes you wonder if you run a high risk of being flaked on after you put a lot of time and money into participating in a swap. While it's not actually required for someone to post in the gallery, it's definitely good etiquette! It's always a good idea to take pictures of what you send in a swap, just in case your partner can't or won't post photos. As for your concern about running a high risk of being flaked on: although it does happen occasionally, Craftster actually has a very small percent of flakers vs. non-flakers in swaps. And, if you do happen to be flaked on, your organizer will post for a swap angel for you, assuring that everyone who sends out in a swap here will receive a return package. Thanks for letting me know. I guess when I first started getting into Craftster and relying on just looking at the boards without really researching I didn't understand the rules so I am finding this board very useful and informative. I just thought if people didn't post about their partner or their package that they never received one. Glad to know that isn't the case.